HRRN's Weekend Stakes Preview Show presented by NYRA Bets. Anthony Stabile and Jude Feld handicap the weekend's biggest stakes races including the G2 Sands Point, Open Mind, G3 Locust Grove, G3 Iroquois, G2 Pocahontas, G1 Ricoh Woodbine, Mile, G2 Canadian, G3 Bold Venture, G1 Northern Dancer Turf, G1 Natalma, G1 Summer, plus give you the weekend's "Best Bet." 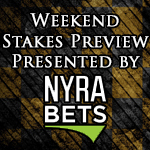 HRRN's Weekend Stakes Preview Show presented by NYRA Bets. Anthony Stabile and Jude Feld handicap the weekend's biggest stakes races including the Allied Forces, Arlington-Washington Futurity, Arlington-Washington Lassie, Juvenile Turf Sprint, G3 Ladies Turf, G3 Ladies Sprint, G3 Turf Sprint, G3 Turf Cup, Royal Delta, Dueling Grounds Oaks, and the Dueling Grounds Derby, plus give you the weekend's "Best Bet." HRRN's Weekend Stakes Preview Show presented by NYRA Bets. Anthony Stabile and Jude Feld handicap the weekend's biggest stakes races including the G3 Saranac, G1 Spinaway, G1 Woodward, G2 Glens Falls, One Dreamer, Tourist Mile, Kentucky Downs Juvenile, Exacta Systems Juvenile Fillies, G1 Del Mar Debutante, G2 Mabee,	G2 Del Mar Derby, and the G2 Prioress, plus give you the weekend's "Best Bet." HRRN's Weekend Stakes Preview Show presented by NYRA Bets. Anthony Stabile and Jude Feld handicap the weekend's biggest stakes races including the G2 Play the King, Shared Belief, G2 Pat O’Brien, G1 H Allen Jerkens presented by Runhappy, G1 Personal Ensign, G1 Ballerina, G1 Forego, G1 Sword Dancer, G1 Runhappy Travers presented By NYRA Bets, G1 Ballston Spa, plus give you the weekend's "Best Bet." HRRN's Weekend Stakes Preview Show presented by NYRA Bets. Anthony Stabile and Acacia Courtney handicap the weekend's biggest stakes races including the G2 Del Mar Handicap, G1 Del Mar Oaks, G1 Pacific Classic, Woodbine Breeders’ Stakes, G2 Sky Classic, Summer Colony, Ellis Park Debutante, Ellis Park Juvenile, and the G2 Del Mar Mile, plus give you the weekend's "Best Bet." HRRN's Weekend Stakes Preview Show presented by NYRA Bets. Anthony Stabile and Jude Feld handicap the weekend's biggest stakes races including G2 Adirondack, G1 Fourstardave, Fasig-Tipton Lure, G1 Secretariat, G1 Beverly D, G1 Arlington Million, G3 Pucker Up, G2 Best Pal, G3 Groupie Doll, G2 Saratoga Special, G3 Fasig-Tipton Waya, G3 Longacres Mile, plus give you the weekend's "Best Bet." HRRN's Weekend Stakes Preview Show presented by NYRA Bets. Anthony Stabile and Jude Feld handicap the weekend's biggest stakes races including the Fasig-Tipton De la Rose, G1 Test, G1 Whitney, G3 Fasig-Tipton Waya, Fasig-Tipton Lure, G3 West Virginia Derby, G2 Yellow Ribbon, G3 La Jolla, G3 Troy, and the Alydar, plus give you the weekend's "Best Bet." HRRN's Weekend Stakes Preview Show presented by NYRA Bets. Anthony Stabile and Jude Feld handicap the weekend's biggest stakes races including the G3 Amsterdam, G1 Vanderbilt, G2 Bowling Green, G2 Jim Dandy, G1 Bing Crosby, G3 Shuvee, G3 Oceanport, G3 Monmouth Cup, G3 Matchmaker, G3 Molly Pitcher, G1 Haskell, and the G1 Clement Hirsch,, plus give you the weekend's "Best Bet." HRRN's Weekend Stakes Preview Show presented by NYRA Bets. Anthony Stabile and Jude Feld handicap the weekend's biggest stakes races including the G3 Sanford, G1 Diana, New York Derby, NY Oaks, G2 San Diego, G2 San Clemente, G3 Ontario Colleen, G2 Nijinsky, G1 Coaching Club American Oaks,Wickerr and the G2 Eddie Read, plus give you the weekend's "Best Bet." HRRN's Weekend Stakes Preview Show presented by NYRA Bets. Anthony Stabile and Jude Feld handicap the weekend's biggest stakes races including the Rockville Centre, Forbidden Apple, G3 Kent, G2 Delaware Handicap, My Frenchman, Victoria, G3 Los Alamitos Derby, Schaefer Memorial, Warrior Veterans, G3 Indiana Oaks, G3 Indiana Derby, plus give you the weekend's "Best Bet."